Our nightmares are as good as our imagination. And we can conjure monsters, cataclysmic events and several shocking scenarios in our dreams. However, when we wake up, we know that all of that’s imaginary. But the real nightmare starts when the reality we live in becomes as terrifying as the one in our dreams. Don’t believe me? Well go ahead and ask the people of Derbyshire. Leicestershire fire and rescue service put up a video of a tornado in what looks to be a field. The twist was that there was a raging fire in the middle of it, making it a firenado. According to The Guardian, the firenado took place in Swadlincote in Derbyshire near a plastics factory. Leicestershire fire and rescue service added that it’s created because of cool air entering from the top of the hot air, thereby causing a swirl of fire. Considering how rare a firenado is, netizens were convinced this is the end of the world and reacted hilariously. 1. That’s very obvious now. 3. We’re all on the same page. 4. Just make sure you run if you see something like that coming at you. 5. It’s too late now. 6. You can say that again. 7. Being 6 years off isn’t a big deal. 9. Someone wake up Aang! 10. Rorschach, is that you? 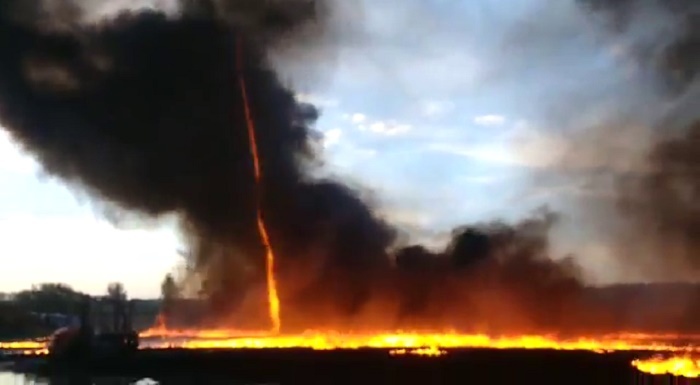 The firenado seriously looks insane and something which can’t be replicated by any amount of CGI. But it also begs the question that is this really an indicator that we should seriously look into our environmental conditions? Because if we don’t, maybe our nightmares and reality will merge to create a hellscape.